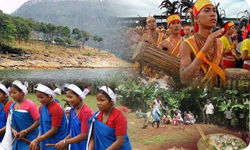 The history of Meghalaya is mainly that of the three major ethnic communities inhabiting the state for centuries. These tribes are the Khasis, the Garos and the Jaintias – each of which follows its own customs and cultural traditions. While the Khasis generally inhabit the central part of the state, the Garos and the Jaintias dwell in the west and eastern regions respectively. 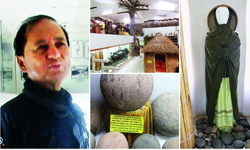 The origin of the Khasi people is in the realm of debate. There are different schools of thoughts that propounded their own theories about their settlement in the north eastern part of India. According to some authorities, they came from Burma (Mayanmar) or Bangladesh due to inundation while the others are of the view that they migrated from Central Asia as part of the Mongolite inflow in India. Much is not known about the origin of the Jaintias. They find their earliest mention in the copper plates, coins and architecture of the Ahom Dynasty the rulers of which ruled from 1228 to 1826. The first of the three tribes to come into a conflict with the British was the Jaintias who fought with the former in 1734 and 1770 under their ruler Chatra Singh. The Jaintias were defeated by the British who however returned their kingdom on payment of fines. Jaintias were bore the burnt of Burmese invasion. Jaintia kingdom was finally annexed to the British empire in 1835. The Garos who are said to belong to the Tibeto-Burman race, are believed to have migrated to Garo Hills from Tibet around 400 BC. The Garo Hills was finally annexed by the British in 1872. After the incorporation of these three kingdoms in the British dominions in India, the British made Cherrapunji the seat of power and introduced a number of administrative and political changes in the region such as dividing the kingdoms into 16 territories, introduction of taxes and setting up a judiciary according to the customary laws of the tribes. Since the humid climate of Cherrapunji was not to the linking of the British, they shifted their headquarters to Shillong which was made the capital of Assam province in 1874. Shillong became the summer headquarter of United Province of East Bengal and Assam in 1905. Carved from the United province of Assam, the State of Meghalaya was formally inaugurated on January 21st 1972, as the 21st State of the Indian Union.